The last weekend before I head off to France for 3 weeks of cycling heaven to join Bikestyle Tours as a riding guide at this year's Tour de France. A fantastic parcours; Vendee, Brittany, Normandy, Massif Central, Pyrenees, the Alps, Grenoble and finally a roll down the Champs-Elysees. 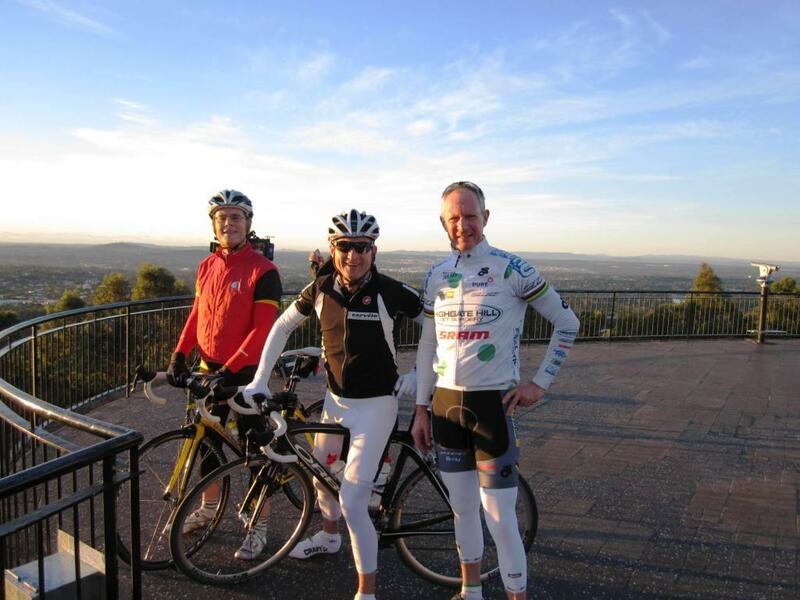 We're also throwing in a ride up the classic Mont Ventoux on the second rest day. This weekend's rides include a fast tempo around Chelmer & River Loop on Saturday, followed by an hour on the Altitude trainer. Sunday we'll hit the hills with a roll over Mt Cootha then to Mt Nebo and finally back to 100 Acre Bar for coffee via Gap Creek Road. Distance of 75km and total ascent of 1,800 metres. GARMIN LINK. For those interested in following some of my Garmin profiles, I have placed a temporary password on my Garmin Connect link. My User Name is rmc2780 and the Password is billy21. (Graze - now you can check out the "truth" for the Alpe D'Huez climb!!) The Garmin Link is on the right panel of the blog along with some other handy links. 1. The Boys at Glow Coffee, Southbank, after Friday River Loop. 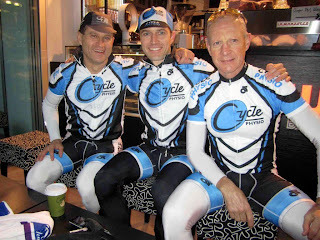 LtoR Graze (my regular training partner), Dave (AKA "Quadsworth" and the man from Cycle Physio), Pete G.
2. 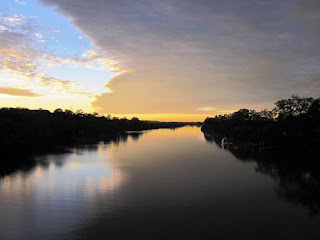 One of the many beautiful morning scenes on our regular River Loop. 3. Mt Cootha Lookout a few weekends ago. 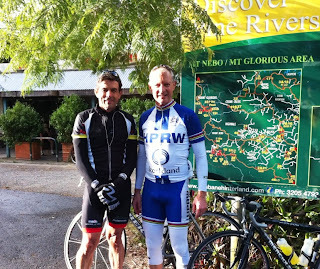 LtoR Paul (who is riding the Alps, Grenoble and Paris with Bikestyle Tours this year), Graze & me.